Crunchy oats and toasted hazelnuts are coated with a melted Nutella mixture and loaded with mini chocolate chips. This insanely crunchy granola is perfect for snacking. This Chocolate Hazelnut Granola is ridiculously delicious. It’s not necessarily healthy when compared to this Maple Pecan Granola or Cranberry Orange Granola, but if you put it next to this Funky Monkey Ice Cream, it’s totally healthy. Besides, life is all about balance anyway, right? Or is that just the excuse we use to eat what we want? Meh–either way, I’m feasting on this chocolate-coated crunchy goodness. I make no excuses where food is concerned. Eat now. Think about it later. This granola is ultra chocolate-y thanks to the addition of melted Nutella and mini chocolate chips. The mini chocolate chips get sprinkled over the hot granola as soon as it comes out of the oven, causing them to melt slightly and adhere to the crispy oats and toasted hazelnuts. It’s all thanks to the mini chocolate chips that this granola is so very addictive. And then there’s the turbinado sugar. It, too, gets sprinkled over the warm granola, adhering to every nook and cranny. It adds a sweet crunch to every bite of granola. 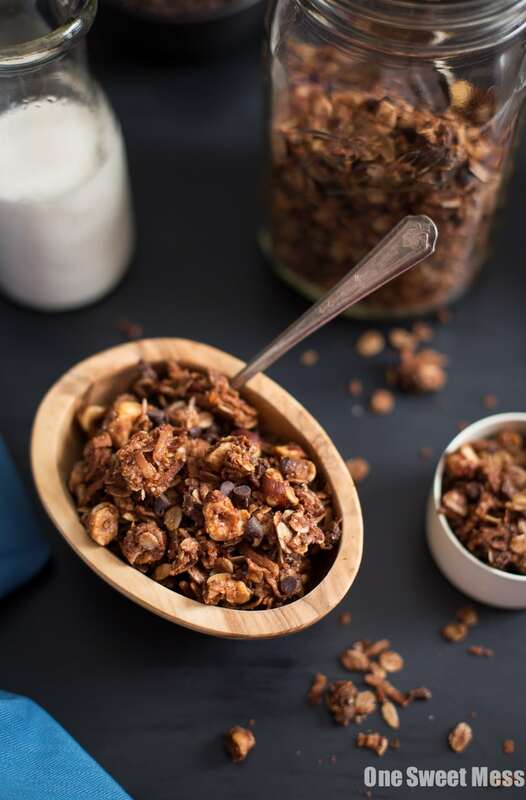 You can enjoy this Chocolate Hazelnut Granola by the handful (my preferred method), or you can sprinkle it over vanilla Greek yogurt. Either way you decide to eat it, you’re going to become instantly smitten with the crunchy goodness. Crunchy oats and toasted hazelnut morsels are coated with a melted Nutella mixture and loaded with mini chocolate chips. Add the oats, coconut, hazelnuts, salt, and brown sugar to a large bowl. Stir to combine. In a saucepan over low heat, melt the nutella, coconut oil, and maple syrup until smooth. Stir occasionally to prevent burning. Take the mixture off of the heat and stir in the vanilla extract. Pour the chocolate mixture over the oats. Fold until all of the oats are equally coated with the chocolate mixture. Spread the oats in an even layer on your prepared baking sheet. Bake for 25-28 minutes, stirring every 10 minutes, until the hazelnuts are golden brown. Remove the pan from the oven and immediately sprinkle the mini chocolate chips and turbinado sugar over the warm granola. Allow the mixture to cool completely on a wire rack. Using your hands, break the mixture into large chunks. Store in an airtight container for up to 3 weeks. Okay, this granola looks AMAZING! I could put this on anything. I love love love that! Such an awesome recipe, girl! You’ve created my idea of the ultimate granola….I adore choc + hazelnut always and just…there’s nothing not perfect about it!